If you’ve got to have Google TV built into your television, the G2 is the best one available right now. 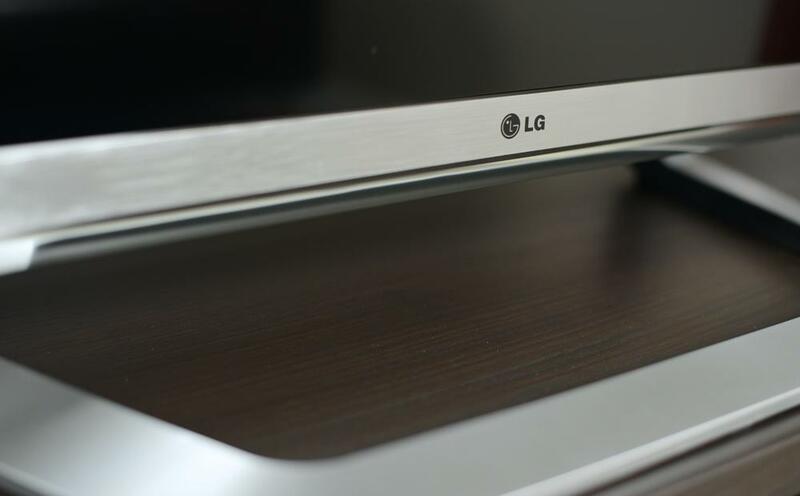 LG G2 series information: The review below is based on our time spent with the 55-inch 55G2 TV. However, the observations made also apply to the 47-inch 47G2 in the G2 series. LG says the sets offer identical features (save weight and dimensions) and should offer similar performance. The last time we crossed paths with Google TV was during our evaluation and review of the Logitech Revue with Google TV. You probably know how that turned out. The Revue with Google TV turned out to be a catastrophe for Logitech. It even helped put former Logitech CEO Gerald P. Quindlen out of a job after the company sustained a $29.6 million loss in the first quarter of 2011. For a while, Logitech went on a verbal bashing of Google. But Google TV is staging a comeback. This year saw the launch of three Google TV-enabled set-top boxes. Vizio bowed the Vizio Co-Star, Sony spit out the Sony NSZ-GS7 and Google will soon be releasing its own Nexus Q. Now there’s the LG G2, only the second television to feature Google TV after Sony put out the NSX-46GT1 over a year and a half ago. The G2 is a 3D, LED edge-lit television available in 47-inch and 55-inch models. 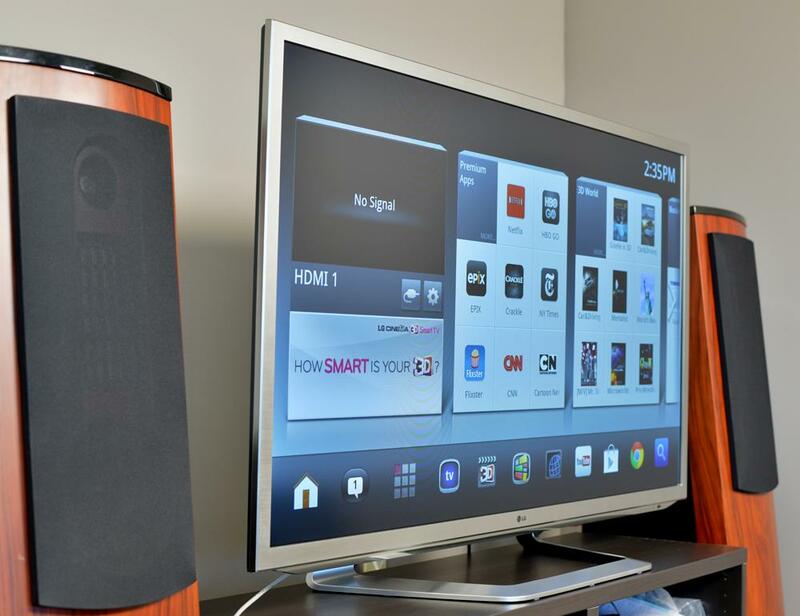 The G2 features a hybrid user-interface that blends LG’s own proprietary approach with Google TV. As you can see from our rating, this television isn’t exactly a rock star, but you might be surprised to find out what we have to say about Google TV this time around. Read on to see if LG and Google make a cute couple and whether this television is worth your consideration. The G2 is a real looker. 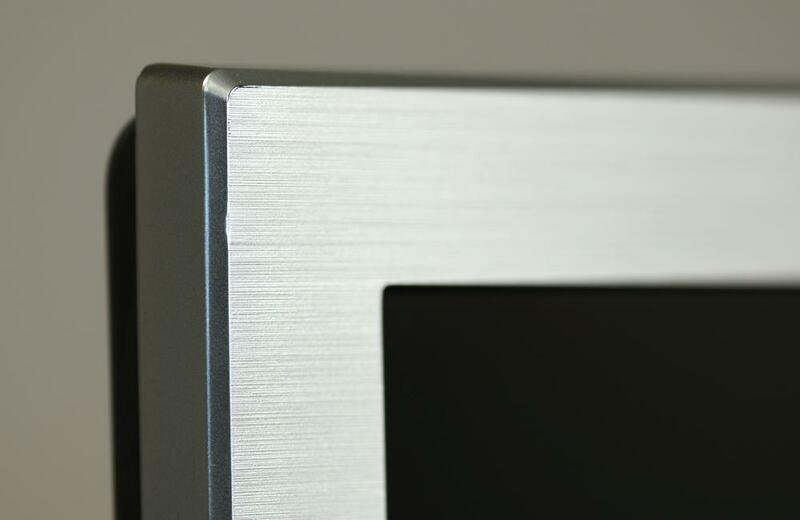 Its brushed aluminum bezel may not be the thinnest we’ve seen, but it makes for some eye-catching trim. The stand that comes with this television is growing on us; it protrudes more than we’d like, but physics…what are ya gonna do? Thanks to LED backlighting, the profile is slim, measuring 1.4 inches at its deepest point. Our 55-inch set weighed 48.3 pounds without the stand. Along with the television and stand, we found six pair of LG passive 3D glasses, some breakout cables, IR blaster cables and LG’s new magic motion remote. 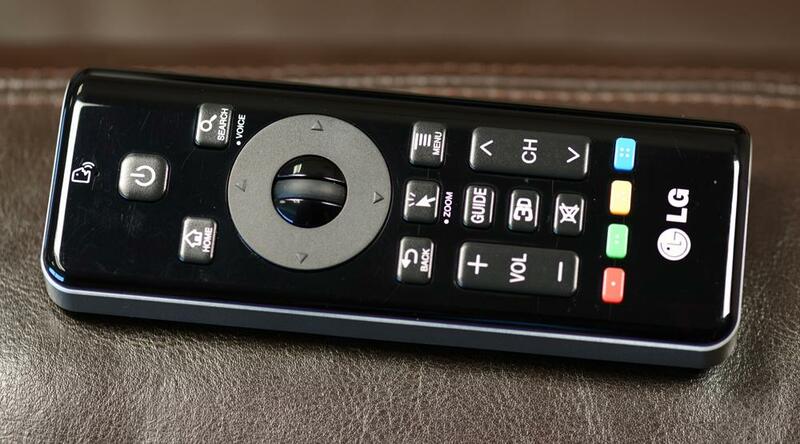 The remote immediately grabbed our attention, thanks to the full keyboard and number pad on its backside. In terms of connectivity, the G2 reads like a top-tier television. 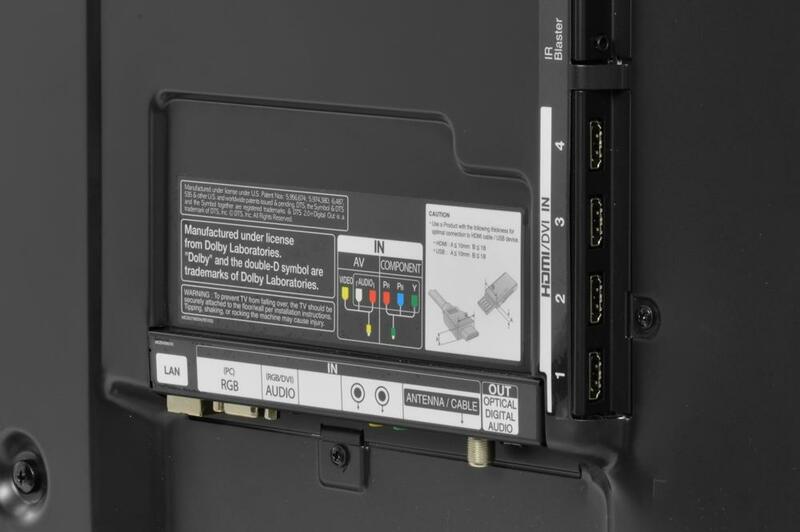 You get four HDMI inputs, three USB inputs, a LAN port, wireless Internet adapter, legacy A/V inputs and a digital optical audio output. The G2 maintains its premium appeal by boasting non-Google TV-related features such as passive 3D capability, a dual-core processor and ISF-level picture calibration controls. The set boasts LG’s “Trumotion 120Hz” frame refresh rate, which is actually a 60Hz native panel that utilizes a smoothing technology to simulate 120Hz. Then there’s the remote, which had us simultaneously skeptical and excited when we first saw it. We disliked the Magic Motion remote the last two times we used it (which we explain in our LG 55LM6700 review), but the inclusion of a QWERTY keyboard on the back and some additional control buttons was enough for us to keep our minds open to new possibilities. 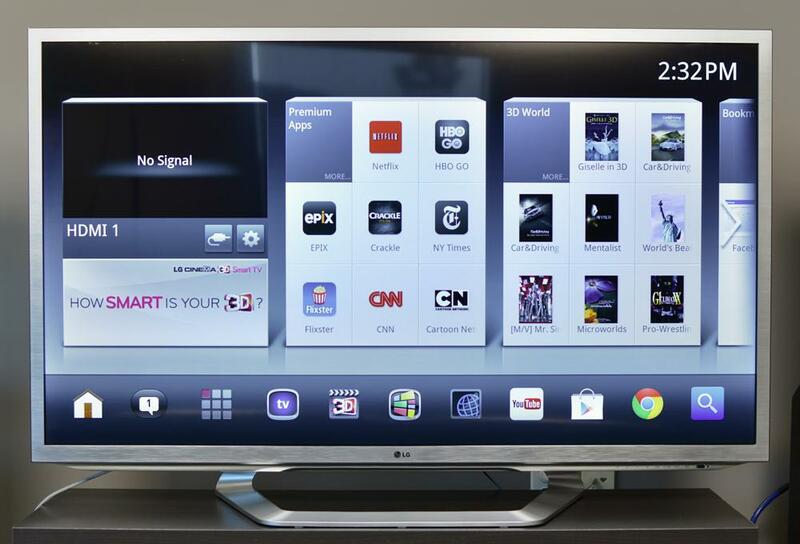 The defining feature for this television is, of course, its integration of Google TV. Google TV adds computer-like functionality to the television by offering a fully functional Chrome Web browser, access to Google Play apps, and leveraging Google’s search engine to put content from multiple platforms just a click away. That’s not the only influence Google has had on this television, though. With the G2, LG blended its smart-television interface with Google TV’s UI to create a sort of hybrid interface that looks a little like an LG menu but works like a Google product. This isn’t your grandpa’s television. This may not even be your dad’s television. And if you are easily frustrated by long, drawn-out setup wizards, this isn’t your television, either, which we learned as soon as we fired it up. You tell it your address, your ZIP code, your cable or satellite provider, the make and model of your cable or satellite box and your Wi-Fi password. You wade through remote-control codes so the IR repeaters can successfully control attached devices. Then, finally, you can start watching some television. Granted, all of the steps were necessary — and we’d just as soon get them over with in one fell swoop — but the wizard doesn’t catch everything. After all that setup, more action is necessary. The setup wizard doesn’t prompt you to enter login information for Netflix, Amazon Instant Video or any of the other subscriber-based services available through the television. So, if you want Google TV to find you free episodes of Law and Order on Netflix when you search for it, you’ll need to enter each app and get the television authorized or set up with login information before Google TV can source the apps for results. Poor Google TV has taken considerable heat from the press. Every tech journalist seems to have simultaneously lined up at the cooler and gulped down a frosty pint of Haterade. Of course, to date, Google TV has just sucked. But we’re going to play the optimist card and suggest that, with the proper changes and improved execution, Google TV has real potential. We’ve been pining for a search feature that aggregates media from the likes of Netflix and Hulu, programming from cable/satellite television service, locally stored media and television-optimized websites such as YouTube, Comedy Central and NPR, and then lay it all out on one screen. Does the revamped Google TV deliver? Sort of. We know not everyone agrees with us, but we give Google credit: The user interface alone is a considerable improvement over any manufacturer’s smart-television efforts to date. Better than Samsung’s Smart Hub (our reigning favorite) and better than LG’s stock interface. And the search feature works much better now because Google TV no longer operates exclusively through a web browser. Google TV now taps apps for content and, if one of those apps provides what you want (say, Netflix), then Google TV will launch that app and start playing exactly what you asked for, right down to the specific episode. We wanted to pull up an episode of Johnny Test for our kids, so we quickly typed that into the Google search field using the QWERTY keyboard and, voila, not only were episodes of the show currently playing on Comcast cable indexed, so too were episodes available on Netflix. If we had a DVR, those would have been indexed as well. We searched for Fox’s hit show, House, and found syndicated reruns were actively playing on two cable channels, but at this point we noticed there were no returns from Hulu. This is because access to Hulu is not allowed on Google TV — a fact that significantly curtails access to popular television programming. Also conspicuously absent is VUDU, one of our favorite HD Movie streaming services. These aren’t the only signs indicating Google TV is not yet perfect. A whole host of television-optimized websites are available through Google TV’s Spotlight portal, offering plenty of desirable content, yet none of that content was exposed in our searches unless we got very specific with our search terms. For instance, we noticed while browsing NPR’s television-optimized site that a live studio performance by Portland, Oregon blues king Curtis Salgado was available. We returned to the Google TV search bar, entered “Curtis Salgado” and looked for the video we had seen moments before. It wasn’t there. We added “NPR” to the search terms along with Salgado’s name. Still nothing. After scrolling down a full page, we noticed Salgado’s name in text associated with an entirely different video. We clicked on that and then saw the video we were after in a related “suggested videos” sidebar. That’s just too much work. And this was just the beginning of our frustration. Web pages are woefully slow to load and scroll through. The browser’s reaction time lags well behind the user’s command and, by the time you realize what is happening, you’ve already scrolled past the point to which you were trying to navigate. We did a lot of bouncing up and down through web pages during our testing, and you can bet we tired of that quickly. Also, because of the Google TV interface, getting to something as simple as the television’s picture settings menu is now at least five clicks away. To add insult to injury, the graphic that comes up when you begin to adjust a picture setting takes up nearly 1/3rd of the screen, dead-center. This makes calibration discs almost useless. We were also perturbed by the G2’s protracted boot time. While signals from connected devices (like your Blu-ray player or cable box) are often displayed within as few as nine seconds, it takes a good 25 seconds for the G2’s user interface to come available. Surprisingly, there is no native support for DLNA streaming. If you have movies, TV shows, music or pictures on your networked PC or a network attached storage drive, you’ll need to run an app like PLEX to access all that stored content. To sum up: Google TV is better than it used to be but still not great. The potential is there, but we think Google needs to make considerable changes before the public-at-large will consider buying in. The G2 garnered its fair share of admiration from family and friends who had a chance to look at the television. Comments on the picture quality were almost unanimously positive. The G2 has a picture that pops and, as such, it will probably fare well on showroom floors. But as we lived with the television for a few days, its shortcomings became increasingly obvious to our trained eyes. The G2’s No. 1 failing is its production of black levels. Blacks are murky and muddled with gray undertones, especially at the screen edges. There, another of the G2’s shortcomings appears in the form of significant screen uniformity problems. When white text scrolls on a black background, waves of light scroll along with the text. Light bleeds like crazy from the edges, top to bottom, showing exactly where the LEDs are mounted. Some local dimming technology would have gone a long way here. Color was a little overblown, too, which might explain why our guests were so attracted to the picture at first glance. The screen explodes with vibrant colors, but that kind of color treatment can create fatigue after a while. Even some measured adjustments with our Spyder4TV HD colorimeter were unable to tame the color beast within the G2. We could go on with a laundry list of other little issues we observed, but we’re going to spare the rod and simply say that the G2’s picture quality isn’t representative of the sort of excellence we’ve come to expect from LG. To say it is mediocre feels a little severe, but LG raised the bar on itself. For our money, the LG LM6700 is a better-looking television, indicating to us that hitching a wagon to Google TV involves some design trade-offs that negatively impact picture quality. Had the G2 bowled us over with excellent picture quality and an only slightly improved Google TV experience or, conversely, had it blown us away with a revolutionary new Google TV interface paired with superior picture quality, we’d be writing a more favorable review. Unfortunately, the G2’s bleeding edge lights and compromised black levels had us furrowing our eyebrows. And because the Google TV experience still suffers some limitations, we’re unable to overlook the image performance. We enjoyed the Google TV search feature, which did a great job of finding content we wanted to watch when we didn’t know where to get it. And the user interface resonated well with us. But if the inclusion of Google TV is going to come at the cost of local dimming technology — which would have addressed most of our picture complaints — it becomes difficult to get too excited. Considering LG’s own 55LM6700 comes in around the same price with the beneficial local dimming feature, we think that purchasing an outboard Google TV product such as Vizio’s Co-Star and adding it to the 55LM6700 and its superior picture quality provides a superior value. But if you’ve got to have Google TV built into your television, the G2 is the best one available right now.